When one leak leads to another, it's time to call A-Plus Roofing Co. Once leaks start, they indicate that the roof system has reached an age where components need some shoring up. Often, leaks can be prevented before they start. Using advanced infrared technology, A-Plus Roofing Co. can find where moisture has penetrated under the cap sheet or bitumen (tar) build-up, waiting for an opportunity to pour into your facility. If your building enjoys the protection of a membrane system, the seams could develop weak spots and "fish mouths." A fish mouth break in a seam presents an obvious problem. While there may still be some adherence to the membrane sheet overlaps, it will likely open completely in the near future. One loosened seal reveals the need to probe the rest. A-Plus Roofing Co. employs installation and repair experts skilled to trouble-shoot every type of membrane roofing system. As tar and gravel roofs age, the tar shrinks which, in time, produces cracks. As it pulls away from walls, protrusions, expansion joints, and even from itself, the Minnesota freeze-thaw cycle begins to widen separations until leaks break through. A-Plus Roofing Co. can seal over those cracks with a modified bitumen membrane to forestall the need for a roof replacement for another few years. Protrusions, HVAC curbs, and parapet walls — anywhere metal flashing contributes to a watertight seal at the edges — need regular check-ups. As the fasteners, either nails or screws, begin to work their way out of the substrate, the flashings become vulnerable to wind and water penetration. A thorough inspection by A-Plus Roofing Co. will find loose metal flashings, and our knowledgeable, professional crew will re-secure them before they become more costly repairs. Also, our crew will hunt for shrinking liquid-applied seals and replace them where needed. 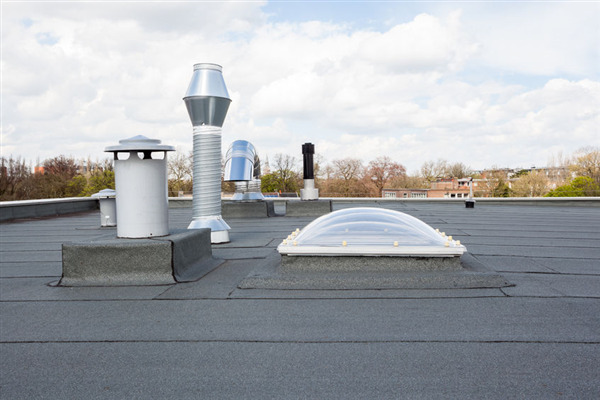 Your roofing system represents a large and valuable investment. By hiring an experienced commercial roofing contractor for semi-annual or annual inspections and needed repairs, you can stretch out the time between large re-roof applications. A-Plus Roofing Co. is located in Burnsville, MN. We serve commercial clients all over the Twin City metro area, replacing, repairing, and maintaining every type of flat roof system. Please call us at 952-894-5435 to schedule your commercial flat roof inspection today. « Why Do Commercial Flat Roofs Leak?